Two recipes from my 50 in 2014 list in one week; it’s definitely been a busy week and one where change is welcome! I found this recipe as a pin on Pinterest, but turns out the blog is also a WordPress blog called Pop an Egg on It. The blogger, Katy, is a mother and has a passion of cooking. She’s battled a lot of eating issues and stomach issues. She discovered paleo and has lost weight and become healthier as a whole person. Her blog is mostly if not all paleo recipes and I can’t wait to try others because this one rocked! 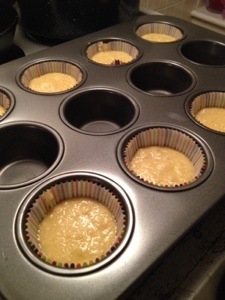 Katy’s breakfast muffins remind me of making paleo pancakes with eggs and a banana when I was prepping them, but with some oil, coconut, honey and almond meal these are so far from the banana bread smelling pancakes. This batch made 8, which is what Katy said it would make. They came out fluffy and light. 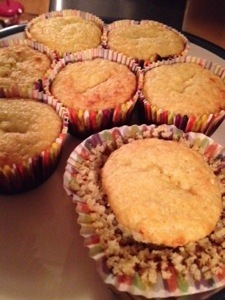 Typically, I think almond meal can be a little chewy and sometimes dense, but these were just like cupcakes. I had set the oven for 350 since I was making other things, and I have never been more happy that I have an oven temperature gauge because the oven was heated to 450! This little guys only needed 10 minutes and they were done. I can’t win with my oven, not at all.